Technopedia Solutions is a Private Limited company, was born from a desire to deliver equally high standards and consistency in website Designing and App Development in Bathinda , Punjab & Through out India. Technopedia Solutions Having Professional Developers, Having Experience of 12+ years in Field of Professional / Industrial Training. 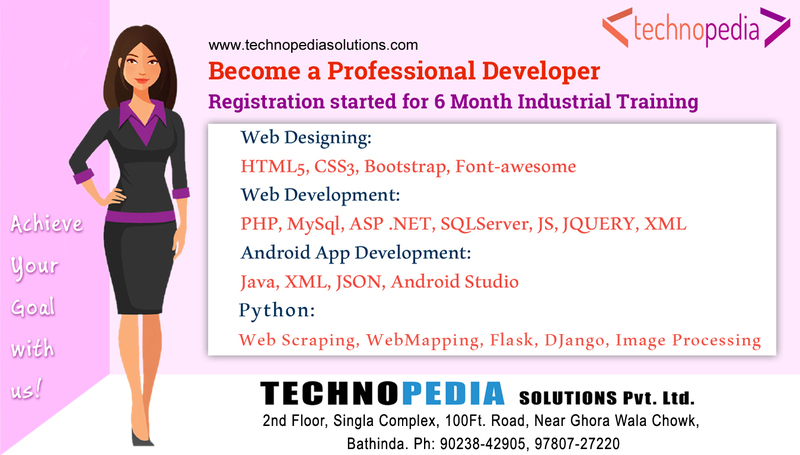 You Can Become Professional Developer by Joining Technopedia. We are providing Industrial Training of 6 month / 6 Weeks in PHP , CodeIgniter , Microsoft.Net , JAVA , Android App Development, R Programming / Big Data , Python & AutoCAD. We offer a unique, creative, and technical vision. Beginning with your initial idea, we persevere with the same intensity all the way to the grand launch ! Technopedia Solutions, belongs to a new generation of hybrid directors who think that digital production can’t be built by just one individual, but must be built by a group of very skilled, distinct, and talented friends. We deliver innovative solutions to support new structuring, continuous optimization, integration and operations of IT systems. We provide a single point of contact to our customers for their varied IT requirements in three main service verticals, turnkey IT infrastructure, Customized application and end to end e-Learning Solution and business solutions on web & mobile platforms. Technopedia Solutions delivers complete web services ranging from custom website design to development of complex enterprise web applications using W3C Standard. We base our services on our clients’ business requirements and provide reliable solutions. Our competency lies in relating business domain knowledge with technology skills and proven methodologies to deliver extraordinary results in a cost-effective manner to maximize your competitive advantage and productivity. We never stop improving our services, including development methodologies, engineering practices, management techniques and QA standards to keep up with the trends in the market. This improves our team’s capabilities and increase customer satisfaction. 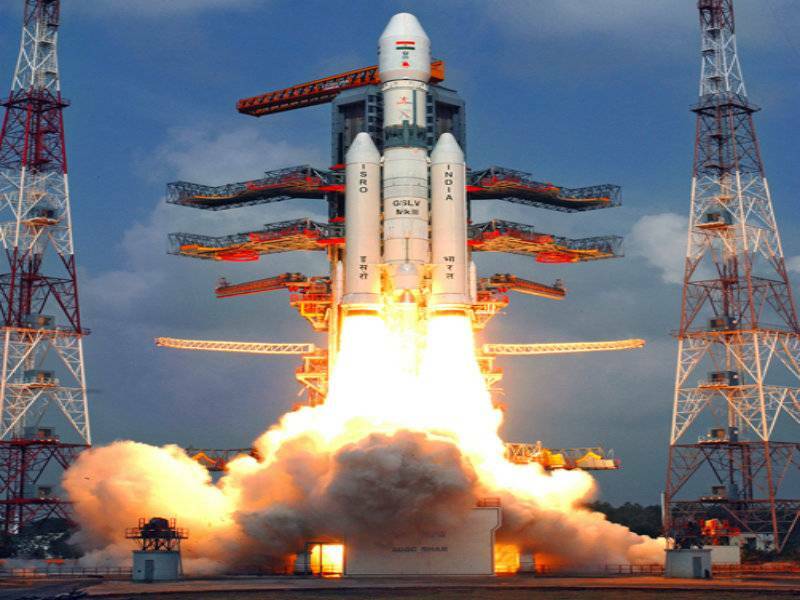 ISRO Set To Test ‘Game-Changing’ Rocket! ISRO Set To Test ‘Game-Changing’ Rocket: Indian Space Research Organisation (ISRO) is gearing up to test a heavyweight rocket. 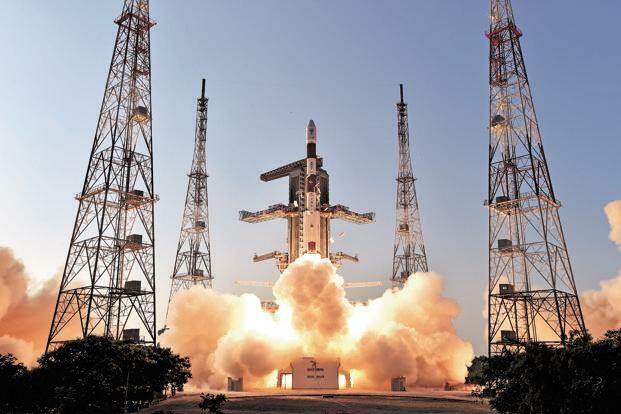 Chairman A S Kiran Kumar said the organisation is planning to undertake the first developmental flight of a “game-changer” rocket capable of launching four-tonne class of satellites from Sriharikota spaceport next month. ISRO rockets (launch vehicles) at present have the capability to launch satellites up to 2.2 tonnes; it depends on international launchers to orbit satellites heavier than that. GST Will Make 70 Per Cent Of All Goods And Some Consumer Durables Cheaper ! Under the proposed goods and services tax (GST) regime some goods such as cosmetics, shaving creams, shampoo, toothpaste, soap, plastics, paints and quite a few consumer products could become cheaper. It is likely that these products will be subject to the slab of 18 per cent rather than the higher one of 28 per cent. 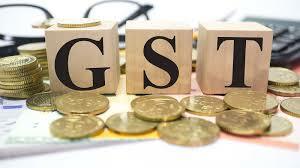 India is likely to rely on the effective tax rate currently applicable on a commodity to get a fix on the GST slab, allowing most goods to make it to the lower bracket, a government official told Economic Times. For instance, if an item comes within the 12 per cent excise slab but the effective tax is 8 per cent due to reductions, then the latter will be considered for GST fitment. Going by this formula, about 70 per cent of all goods could fall in the 18 per cent bracket. The GST Council has finalized a four-tier tax structure of 5 per cent, 12 per cent, 18 per cent and 28 per cent but has left room for the highest slab to be clinched at 40 per cent. A final call on the fitment is expected to be taken by committee of officials at its next meeting on 18-19 May. GST, India’s biggest tax reform in decades, is expected to be effective from 1 July 2017. 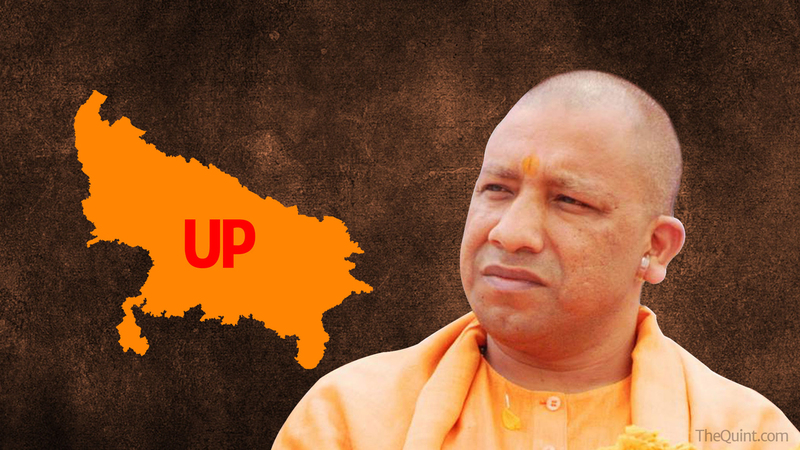 In Uttar Pradesh Chief Minister Yogi Adityanath’s first cabinet meeting in Lucknow today (4 April), loans worth Rs 30,729 crore were waived off for the small and marginal farmers. Beneficiary farmers will reportedly number around 86 lakh. Farm loan waiver was the talking point well before the meeting was announced as the farming community had urged the Bharatiya Janata Party (BJP) to waive off loans – a promise the party itself had made during the recently-concluded assembly polls, and the Prime Minister himself much earlier. While it can be said at this point that the BJP is keeping its election promise, critics have raised doubts over the effectiveness of populist measures like loan waivers. Too much focus has been laid on keeping unviable farm businesses alive by extending unsustainable artificial support and subsidies. “India needs an exit policy for unviable farmers and farming, not indefinite life support for them to stay in comatose conditions forever,” R Jagannathan has written about farm loan waivers. Does this mean that farmers should not be extended relief in exceptional circumstances? Of course not. But instead of waivers from governments, the burden of natural disasters should be substantially borne by insurance. In highly exceptional cases, “debt relief can be considered, but only on accumulating interest dues, not the principal,” writes Jagannathan. The government plans to achieve renewable energy target of 175 gigawatts (GW) by the year 2022. Out of the total 127 GW, 100 GW will be solar energy. The Piyush Goyal-led Ministry of New and Renewable Energy has taken several steps to achieve this target. Over 14,000 MW of solar power projects are currently under development and about 6 GW will be auctioned soon. Around 4 GW of solar capacity was added in 2016 and over 8.8 GW capacity will likely to be added in 2017. India’s solar power generation capacity, that stood at 3000 megawatts (MW) in 2014, has registered a three fold rise in just three years. The country now has an installed capacity of generating 10,000 MW of solar energy. 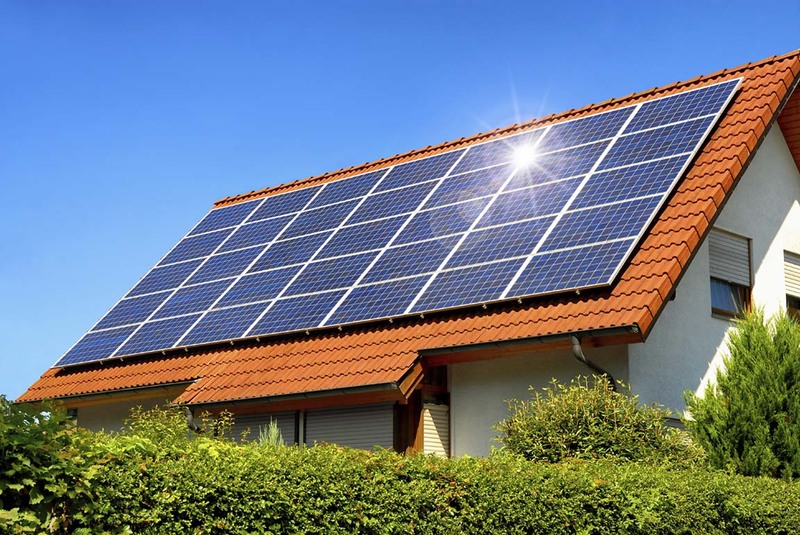 The government is also planning a Rs 21,000 crore package of state aid for India’s solar panel manufacturing industry. Prayas, or Pradhan Mantri Yojana for Augmenting Solar Manufacturing, is a central government plan designed to raise India’s installed photo-voltaic capacity as well as to create an export industry for it. The government has also succeeded in bringing down tariffs, as low as Rs 2.97 per unit in some cases. India’s electricity demand is projected to increase threefold by 2030. In the recently released national electricity plan, the Central Electricity Authority projected the need for 350-360 GW of total generation capacity by 2022. By pushing forward the growth in energy sectors such as wind, solar, geothermal and hydro-power, the country can significant reduce the shortfall with almost no environmental cost. 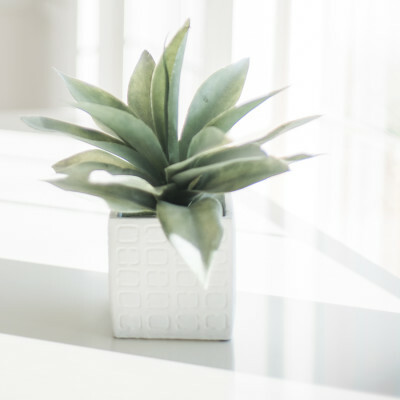 5 ideas for making money online with a Small budget ! The next big issue is selling products. If you have experience with sales, help other startups. Don’t be afraid to share your knowledge with others. I know how we struggled for a single sale in our first startup where we were selling ERP to schools. Idea # Hiring and firing We could have saved a lot of money by avoiding hiring a bad guy (who ran away with our laptop after two months). We caught him eventually but we wasted so much time on the chase. He was a designer. He was a bad hire. We should have fired him after the very first month. One of the rules of running a successful startup: “Hire slow but fire fast when you are in doubt.” If you know how to find the right candidates for a startup, you can help a lot of startups who are losing value because of bad hiring processes. 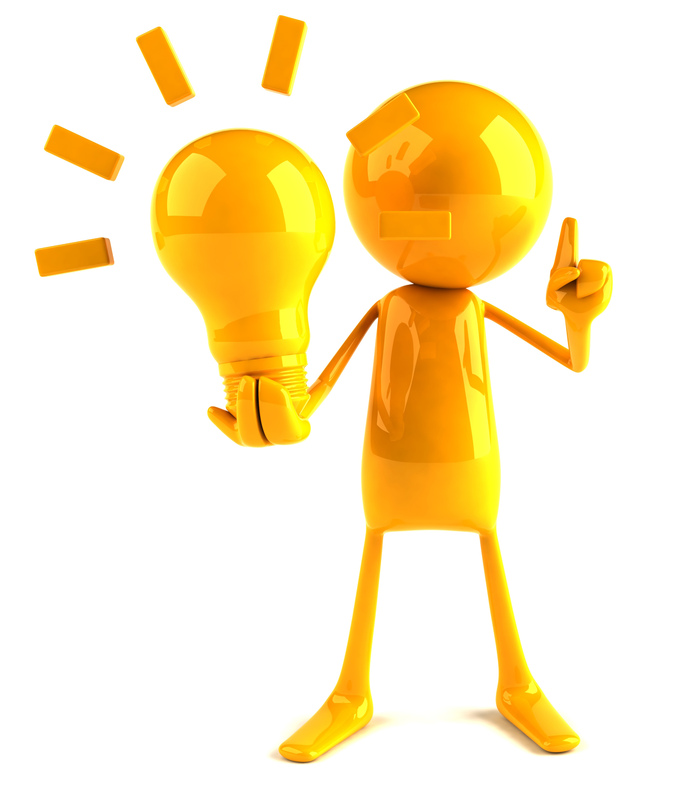 You can come up with your own innovative ideas to select the right candidates for the right job position. Idea # Stock market and business news Although it was once my favourite domain, I stopped reading stock and business news because of all the noise surrounding it. I do not trust the so-called market gurus who advise anything for their own benefit. There are very few people who provide information that is actually useful for investors. Here comes an opportunity for you. If you are really interested in stocks or business, then become a trusted source of information. You can make a good business only after doing remarkable work in any field. I am not giving you ideas for tech blogs in this article as my purpose is to show you the potential of writing a blog on any technology. If you have something in mind, do your keyword research and start a blog. India’s gross domestic product (GDP) growth rate registered a healthy 7 per cent during the demonetization period from October to December last year. 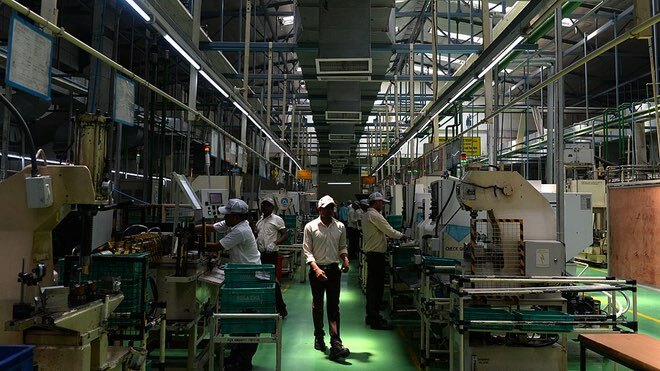 GDP growth rate during 2016-17 is estimated at 7.1 per cent, reported ANI, which is a 0.8 per cent fall from the 7.9 per cent figure from 2015-16. 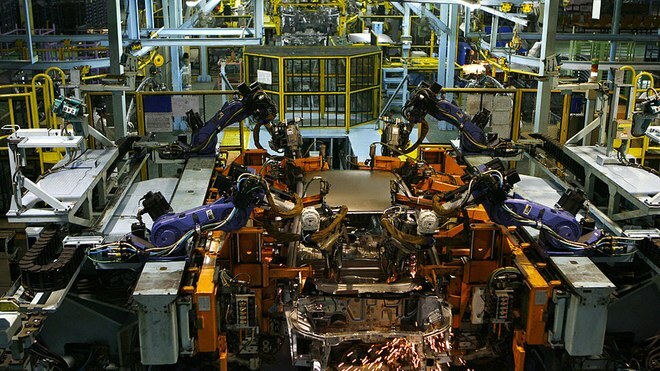 Economic Affairs Secretary Shaktikanta Das said the Indian economy held its own despite the negative projections. Several predictions emerged in the wake of demonetisation. While Goldman Sachs predicted GDP growth to fall by 1.1 per cent, Care Ratings estimated a drop of 0.3-0.5 per cent. The Centre for Monitoring Indian Economy even had a precise figure for economic loss. IMF Sees India Growth Rate At 8 Per Cent In Few Years: The International Monetary Fund (IMF) said in its annual report that demonetisation would have only short term impact on India’s economy and it would bounce back to its expected growth of more than eight per cent in the next few years. It added that India’s growth is projected to slow to 6.6 per cent in 2016-17 fiscal due to “temporary disruptions” caused by demonetisation. Mr.Modi Says Efficient Governance Can Ease Burden On Judiciary: Efficient governance can lessen the burden of judiciary and the government is in the process of cleaning the system, Prime Minister Narendra Modi said on Wednesday. “And when I say efficient governance, then I see the link from the drafting of the law to its implementing authority,” he said. The Prime Minister appreciated Chief Justice of India J S Khehar for his “quick decisions” saying he was liking it. The Indian government has been making a big push for digital payments since demonetization of old currency notes. In a move to promote Digital India initiative and encourage cashless payments, the government has introduced Unified Payments Interface (UPI) for smartphones, and Unstructured Supplementary Service Data (USSD) based mobile banking for basic and feature phones. The government has also introduced Bharat Interface for Money (BHIM) app, which is a unified UPI app, and Aadhaar Pay that enables you to make cashless money using Aadhaar card and your fingerprint for biometric authentication. 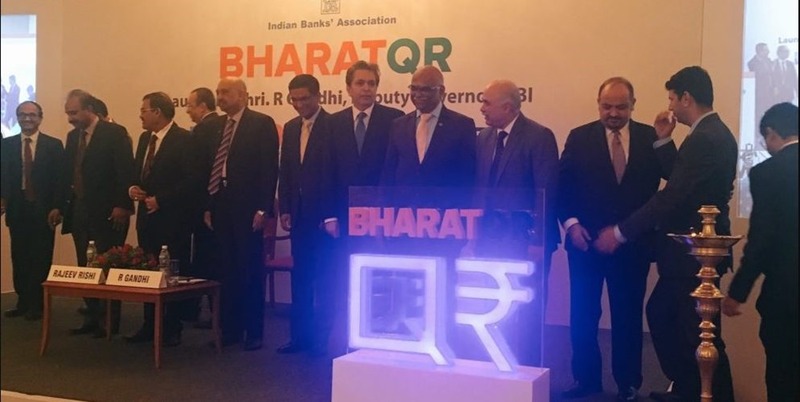 Now, to further ease the payments process, government has introduced Bharat QR Code for cashless electronics payments. The QR code-based payments are accepted by most merchants across India, but they are largely closed systems. Visa is a pioneer in QR Code payments and it has already launched mVisa in India a year-and-a-half ago. Last year, DTH operator TataSky had partnered with Visa to allow and accept QR code-based payments from its subscribers. In fact, mVisa is the widely accepted payment option across the globe. In November 2016, MasterCard launched its ‘Master-pass QR service’ in partnership with Ratnakar Bank’s Ongo payment wallet. RuPay was also expected to come up with its QR code-based solution, but there is no word as yet. Since demonetization, e-wallet apps such as Paytm, Free-charge and Mobikwik, among others have also seen a surge in usage. While these wallet apps also allow QR code-based payments, both parties need to have the app. 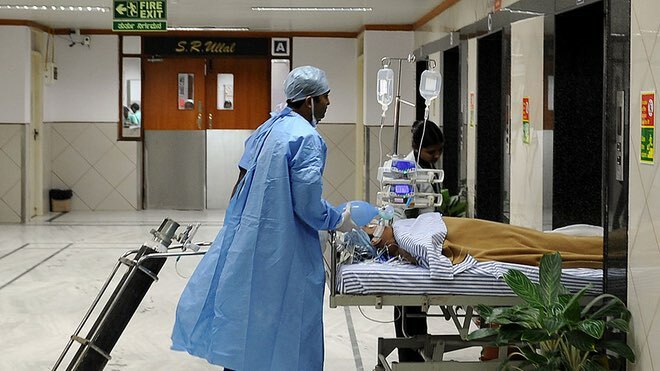 In a move that will benefit cardiac patients across India, the National Pharmaceutical Pricing Authority (NPPA) has today (14 February) put a ceiling on the prices of coronary stents -- small metal mesh tubes used to open up narrowed or blocked arteries. As reported by Isha Trivedi for Mint, the price of bare metal stents has been capped at Rs 7,620 per unit, and that of drug-eluting stents and biodegradable stents has been fixed at Rs 29,600 per unit, excluding the local tax. This new price will come into effect immediately. Taking up almost 95 per cent of the market space, drug-eluting stents currently cost anywhere from Rs 30,000 to Rs 80,000. Dissolvable stents, on the other hand, cost as much as Rs 2-3 lakh. A bare metal stent, on the other hand, costs in the range of Rs 7,000 to Rs 20,000, as per the Mint report. Isro set to launch record 104 satellites ! Indian Space Research Organizations (ISRO) workhorse Polar Satellite Launch Vehicle (PSLV) will carry a record 104 satellites in a single mission on 15 February from the space center at Sriharikota in Andhra Pradesh. “PSLV-C37/Cartosat-2 Series Satellite Mission is scheduled to be launched on February 15, 2017 at 9.28 hours IST from SDSC SHAR Sriharikota,” ISRO said. The PSLV, in its 39th flight (PSLV-C37), will launch the 714kg Cartosat-2 series satellite for earth observation along with 103 co-passenger satellites, together weighing about 664kg at lift-off. It will be launched into a 505km polar Sun Synchronous Orbit (SSO). ISRO said the co-passenger satellites comprise 101 nano- satellites, one each from Israel, Kazakhstan, the Netherlands, Switzerland, United Arab Emirates (UAE) and 96 from United States of America (USA), as well as two from India. The two Indian nano-satellites are Isro’s INS-1A and INS-1B. INS-1A and INS-1B will carry a total of four different payloads from Space Applications Centre (SAC) and Laboratory for Electro Optics Systems (LEOS) of ISRO for conducting various experiments, the space agency said. Last year, Isro had launched a record 20 satellites at one go. The highest number of satellites launched in a single mission is 37, a record that Russia set in 2014. The US space agency, NASA has launched 29. The 101 international customer nano-satellites are being launched as part of the commercial arrangements between Antrix Corporation Ltd (Antrix), the commercial arm of ISRO and the international customers. Speaking on the record launch, ISRO chairman Kiran Kumar had earlier said the aim was to maximize the capability with each launch and it was not to set a record. “We are not looking at it as a record or anything like that; we are just trying to maximize our capability with each launch, in trying to utilize that launch for the ability it has got and getting the maximum return,” he had said. RBI to launch new Rs. 100 currency note soon !! The Reserve Bank on Tuesday said it will soon put into circulation Rs. 100 denomination notes in market with enlarged identification features. The Reserve Bank will shortly issue Rs. 100 denomination banknotes in the Mahatma Gandhi Series-2005, without inset letter in both the numbering panels, RBI said in a release. The notes with 2016 printing year will be similar in design with the existing Rs. 100 notes in the Mahatma Gandhi Series-2005 having ascending size of numerals in the number panels, bleed lines, and enlarged identification mark, on the obverse. RBI said it has already put to circulation Rs. 100 currency notes with the ascending size of numerals in the number panels but without bleed lines and enlarged identification mark. These banknotes will remain in circulation concomitantly with the banknotes being issued now, it added. All the banknotes in the denomination of Rs. 100 issued by the Bank in the past will continue to be legal tender RBI said further. Besides, earlier this week RBI had said that it will issue Rs. 20 and Rs. 50 denomination currency notes. Launch of these small value currencies will be a big relief to common consumers to meet their daily requirements as the Rs. 2000 denomination bank note available currently has a limited acceptability as finding a change is a big issue when almost 86 per cent of the cash has been wiped off the market to abolish Rs. 500/1000 banknotes. 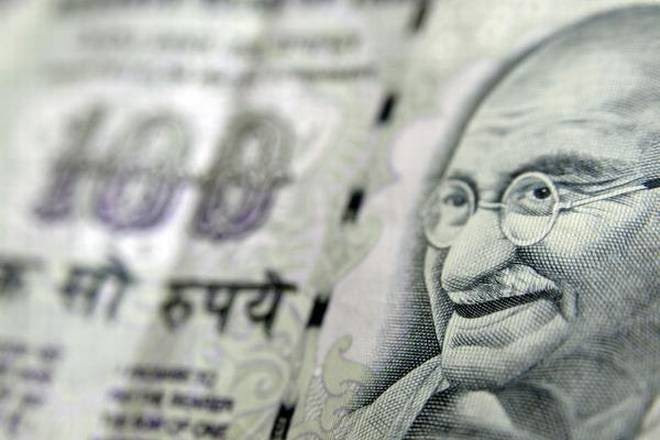 The Indian rupee on Thursday strengthened past the 67 mark to hit a fresh three-month high against the US dollar after foreign investors continued to buy in local equity and debt markets. This was the 11th out of 12 sessions when the rupee is trading higher. 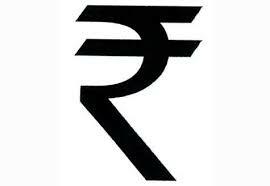 Rupee strengthens against US dollar , for ninth consecutive session. The Indian rupee on Monday strengthened against the US dollar tracking the gains in the local equity and Asian currencies markets. The rupee gained for the ninth consecutive session, its longest winning streak since June 2011. Traders are cautious ahead of an event heavy week. The local currency opened at 67.21 a dollar and touched a low of 67.20, a level last seen on 11 November 2016. At 9.15am, the home currency was trading at 67.22, up 0.17% from its previous close of 67.32. The Reserve Bank of India (RBI) will meet on Wednesday for its bi-month policy. Seven out of 10 bank economists polled by Mint expect RBI to cut its repo rate by 25 basis points to 6%. The other three expect the repo rate to remain unchanged. India’s benchmark Sensex index rose 0.24% or 69.17 points to 28,309.69. So far this year, Sensex has risen 6.1%. India’s 10-year bond yield fell to 6.398% from its Friday’s close of 6.409%. Bond yields and prices move in opposite directions. 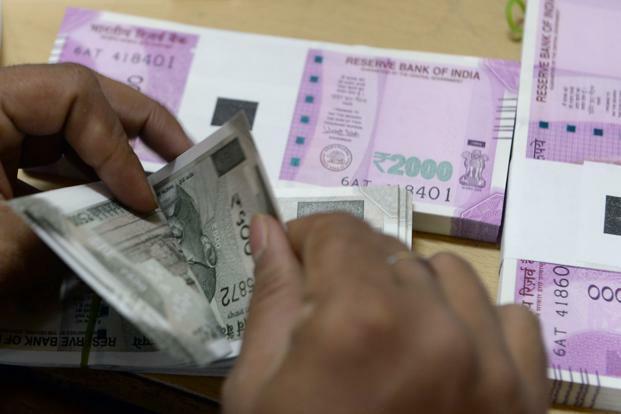 Since the beginning of this year, the rupee has gained 1.05%, while foreign institutional investors (FIIs) have bought $111.40 million from local equity and sold $247.20 million in debt markets. Asian currencies were trading higher as the dollar weakened after mixed US employment data reduced expectations for a US Federal Reserve interest rate increase in March. South Korean won was up 0.83%, Taiwan dollar 0.18%, Japanese yen 0.12%, Philippines peso 0.11%, Indonesian rupiah 0.1%, Singapore dollar 0.08% and China renminbi rose 0.07%. However, China offshore spot was down 0.04%. The dollar index, which measures the US currency’s strength against major currencies, was trading at 99.71, down 0.16% from its previous close of 99.87. The income tax rate for the tax slab of ₹250,000 to ₹500,000 from 10% to 5%. This is expected to reduce the tax liability of all persons earning up to ₹5 lakh, to zero with rebate or half. To avoid duplication of benefit, the existing rebate to the same group of beneficiaries will be reduced to ₹2500, available to assessees having income up to ₹3.5 lakh. Combined effect of these mean that there will be no tax liability of individuals earning up to ₹3 lakhs. Tax liability of only ₹2500 for those earning between ₹3-3.5 lakhs. Individuals earning up to ₹4.5 lakhs will have no tax if they use the full limit of ₹1.5 lakh in investment under Sec. 80c. All other taxpaying individuals in subsequent brackets will get a uniform benefit of ₹12,500 per person. There will be a 10% surcharge for those whose annual income is ₹50 lakh to ₹1 crore. The existing 15% surcharge for those whose annual income is above ₹1 crore will continue. Small firms with turnover up to ₹50 crore will now only need to pay 25% tax instead of 30%. Firms incorporated after 31st March 2016 could now avail of a three-year tax holiday in the first seven years of their existence. Out of 3.7 crore who filed tax returns in 2015-16, only 24 lakh persons showed income above ₹10 lakh. Of 76 lakh individuals who reported income of over ₹5 lakh, 56 lakh are salaried. There is also a proposal to allow a carry forward of Minimum Alternative Tax for a period of 15 years up from the current 10 years now. Web browsers are no longer limited to opening web pages, but are becoming a new platform in itself. Platforms such as Air Console allow users to use their laptop as the screen, web browser as the console and smartphone as the controller to play games. Google’s new Android Instant Apps program is built on a similar premise of flexibility and convenience, but will be limited to mobile browsers for the moment. It will allow users to run a version of a mobile app on a mobile browser even if the native app is not installed on their smartphone. What makes Instant Apps different from apps that already have a version for mobile browsers such as Facebook or Amazon is that they can run those apps and even games which do not have a version for web or mobile browsers. Announced first at the Google’s I/O developer conference in Mountain View California in May 2016, Instant Apps is a part of Google’s Early Access program and will be available only to users who sign up for it with the Android Instant Apps web-page. User can open a mobile app in mobile browser by typing the name of the app in their mobile browser and tapping on the app icon that shows in the search results. In a regular scenario users will be redirected to the Google Play Store so they can install the app. With Instant Apps, user will remain on the mobile browser and access many of the features of the original app on it. Instant Apps, however, cannot replicate the entire app experience as it can’t use background services or access unique device identifiers that are available to native apps. Apps for Instant Apps program will be built using the same Android API, project and source code that are used in apps. Developers can put their apps on Instant Apps by creating separate build artifact for Instant Apps version besides the APK file. As of now only four apps Periscope, Buzz-feed, Vikki and Wish are available on Instant Apps platform. Apps on Instant Apps will be the exact replica of the mobile app in terms of the visual appearance, and also with most of its features. So if you open Periscope on mobile browser, you can access all its features such as live streaming, typing comments, expressing likes or dislikes form the browser itself. This will do away with the need to download multiple apps on one’s phone.